Recently, a documentary was brought to my attention by a couple people – friends from the gym as well as a co-worker. Kyle and I watched it a few weeks ago, and have been talking about it ever since. Fed Up focuses on the obesity problem in the United States, and highlights the effects of sugar in our diets. While they used the US as their main target, it’s obviously a problem in many countries, including Canada. Currently, more than half our adult population is overweight or obese, with no sign of this stat decreasing in the near future. With it, rates of Type 2 diabetes and other chronic diseases are on the rise – along with healthcare costs. We’re essentially digging our own graves, and fast. Evil, but still looks tasty. 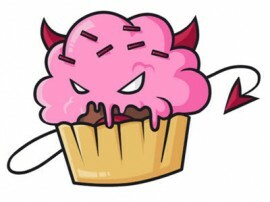 Everything in moderation, even evil cupcakes. It was heartbreaking to hear the stories in the movie; Kids who are morbidly obese, some of which are trying to be more active to lose weight and can’t figure out why it’s not happening; Parents who have no idea what they’re buying at grocery stores, stocking their cupboards with packaged foods which are strategically marketed as healthier options but are still full of crap; Entire families who are morbidly obese, or quickly on their way to that point, and can’t reverse the damage. Why? Because they’re addicted to food and lack the knowledge to make better food choices. Is food addiction a real thing? You bet it is. 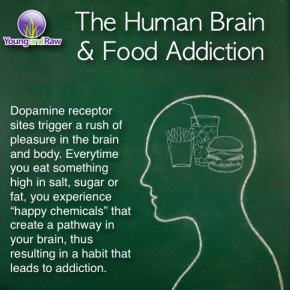 Like other pleasurable behaviours, eating triggers the release of the hormone dopamine, which makes us feel good. Over time, the association of eating and this great feeling is matched together and becomes tough to shake. Having a bad day? Doughnuts made you feel better last week, so let’s eat them again. Food can have the same impact on the chemicals in your brain the same way drugs do. I’m sure many of you have heard or read about the similarities between sugar and cocaine and their effects on your brain. Well, much like drugs, our tolerance levels adapt with food and we need more to feel the pleasurable release. The great feeling which once came easily from a single cupcake now takes a cupcake, ice cream, and a chocolate bar– in one sitting. As the tolerance grows, so does the waist line! Unfortunately, it’s a cyclical relationship. Research has found that the dopamine receptors in the brains of many obese people are dulled – meaning it takes more stimulation to get a result (i.e., more food!). Experiments in both animals and humans have shown that “highly palatable” foods trigger the strongest chemical responses. Highly palatable foods are those high in sugar, fat, and salt…. So, basically all the fun, good stuff. The fun food we get easily addicted to. Obviously, the biggest issue with food addiction is that you can’t quit food. With other substances such as drugs and alcohol, you *can* cut them out of your life and be fine (in theory and basic physiological function – not saying it’s easy to quit any addictive property). BUT, you can’t escape food. You’ll still need to shop, cook, and eat, making it that much harder to limit or remove the highly addictive items from your life. Social outings will be packed with tempting foods, your family members may bring them into the house or request going out to a favourite restaurant. There are so many challenges when trying to avoid unhealthy foods. It’ll be a struggle for sure, but breaking the addiction to sugar, fat, and salt can be done. As with any lifestyle change, do it slowly. Be mindful of what you’re eating and remove items slowly over time. Cut out the afternoon candy breaks, reduce the sugar in your coffee, and go out for food less frequently. 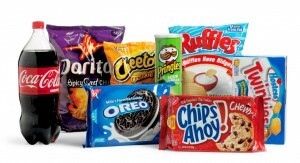 Additionally, find healthy ways to satisfy your cravings. There are healthy options you can use to replace junk foods – add some cinnamon or pumpkin pie spice to Greek yogurt, or blend frozen bananas and strawberries with a little almond milk to make ice cream. Caramel (or chocolate) rice cakes are another great option to get both the sweet taste and crunchy texture of a snack. Often, you just need to get a little creative to think of healthier options. Just like everything else, it’ll take time for your body to adjust to the reduction in sugar, salt, and fat. You’ll crave these things, often in the evenings or when you’re bored. Keep yourself busy when cravings hit by being active, reading, or doing housework (seriously, I wash dishes to stay busy and not think of food during prep). Finally, don’t beat yourself up for having a treat from time to time. It’s unrealistic to think you can eat perfectly 24/7. You’ll probably drive yourself crazy trying to stick to a super restrictive plan and will likely crave these foods more by proclaiming them as “off limits”. It’s all about moderation – fill up on healthy foods and your body won’t need the junk! This entry was posted in Education, Fitness, Health, Lifestyle, Mental Health, Motivation, Nutrition, Uncategorized, Wellness and tagged addiction, biology, Canada, chemistry, eating, education, fat, food, food addiction, health, healthy, healthy snacks, junk food, mental health, nutrition, obesity, salt, snacks, sodium, sugar, United States, weight, weight loss, wellness. Bookmark the permalink.